Sleek minimalist style isn’t enough to save the Oaxis Timepiece from its unhelpful notifications and basic fitness tracking woes. The Oaxis Timepiece is a reasonably-priced smartwatch that falls between full smartwatch and fitness tracker — a rapidly growing middle ground that also includes hybrid smartwatches. 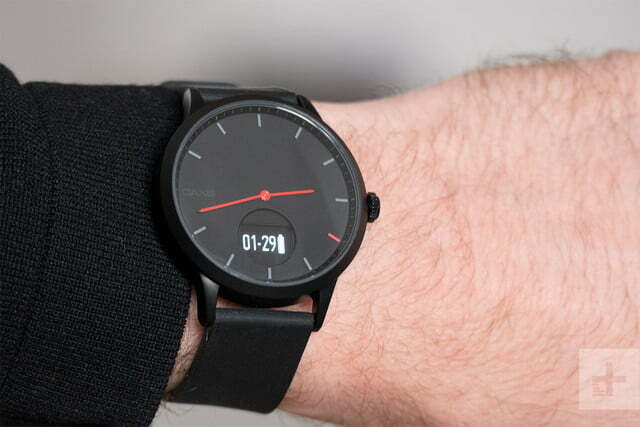 The Timepiece has an analog watch face and a tiny OLED screen to show key data, plus a heart rate sensor on the back. This suggests it could be exactly what many want — a smartwatch that doesn’t look like a smartwatch, with all the latest features. Except, we should not be irritated by the technology we invite into our lives. If we pay for something that’s supposed to increase convenience, it should do that. The Oaxis Timepiece needs to maintain a balance between these two aspects if it’s to remain helpful — whether affordable or expensive — and sadly, it falls short. Here’s why. Oaxis has chosen a minimalist design for the Timepiece, reminiscent of the Nokia Steel HR, with an analog watch face and a very small 0.42-inch OLED screen in the lower half. Our review model has a black stainless steel body measuring 41mm across, and is just under 13mm thick. The strap has quick release tabs and measures 20mm. 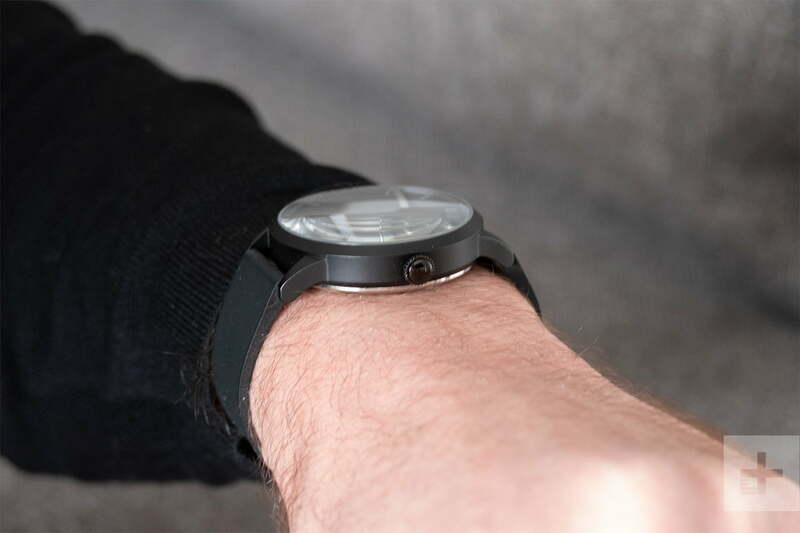 Oaxis also makes a 38mm version with an 18mm strap, making the watch suitable for most wrist sizes. The hands are red, and inexplicably so is the 4pm marker on the face, which is covered by what we think is mineral glass. This attracted a lot of grime and smudges during our time with the watch, despite it not being a touchscreen. Aside from the Oaxis logo in the 9pm position, there’s no other visual flair, so it’s not a watch for attracting attention. It’s slim enough to slip under a shirt sleeve, and because it’s not a big, shouty thing, this is arguably where it belongs. 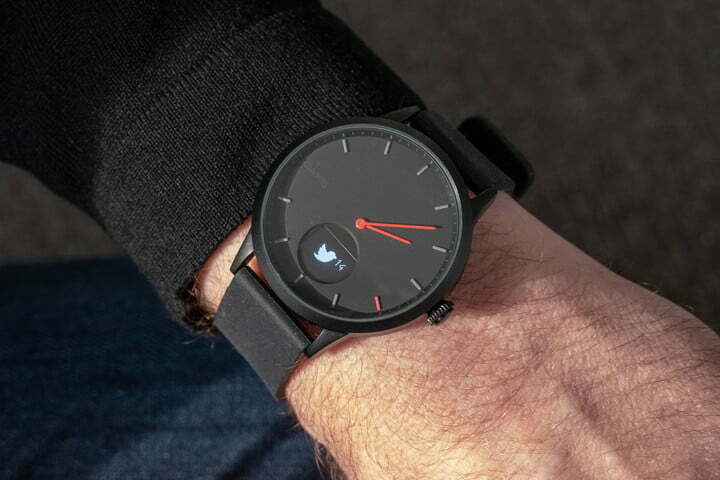 A silicone strap holds the Timepiece on your wrist, and it’s very comfortable. The Oaxis Timepiece looks good. But upon closer examination there is one aspect we don’t like — the OLED screen is set inside a circular cutout, but is itself oblong. Worse, the corners of the oblong screen are slightly cut off by the circular hole, making it all look haphazard and poorly thought out. It’s one of those, “once-you-see-it” problems’ and has continued to irritate us when looking at the Timepiece. This aside, the Oaxis Timepiece is an unobtrusive, subtle watch that will suit almost all wrist sizes. The build quality is great, it’s not heavy, and the domed glass provides depth and shape to the face. We like the crown’s texture, despite not actually needing to grip it, but do feel it’s a little too large for the slimline body. Overall, we’re fans of the Timepiece’s minimalist style. 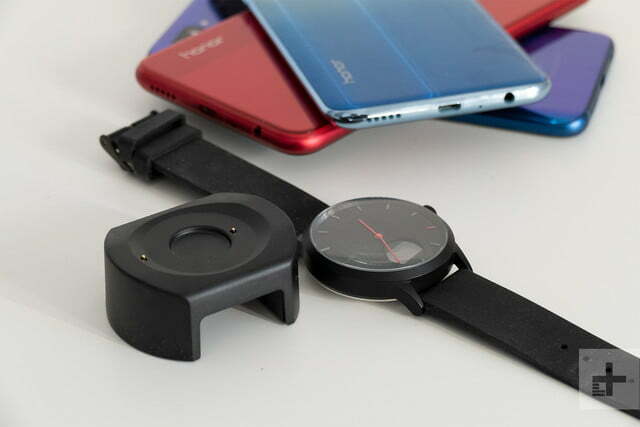 If the oblong-in-a-circular hole aspect wasn’t bad enough, the Oaxis Timepiece’s screen flip-flops between being vaguely helpful to absolutely useless. It shows step count, calories burned, the date, the amount of battery life remaining, and heart rate clearly with a press of the crown (the crown is a button and does not rotate). But the notification delivery system is so bad, it’s almost laughable. Rather than scroll notifications across the two-line display, it shows notifications on a screen-by-screen basis, and then for good measure often makes them utterly impossible to read by just displaying a few letters at a time. 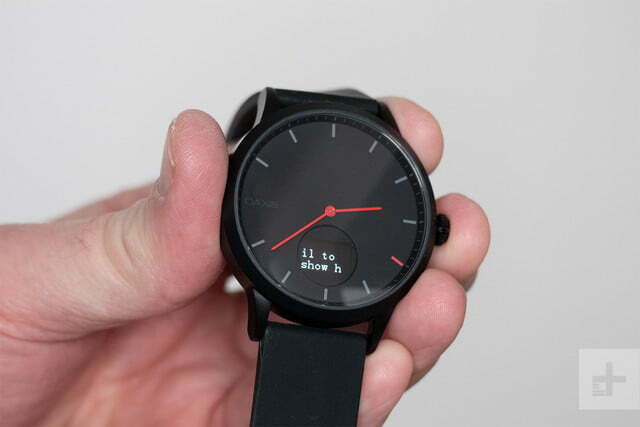 No excuses: Notifications must be glanceable on a wearable, and they’re not on the Oaxis Timepiece. If you pay attention it’s possible to thread them all together in your head to get the gist of the message, but why should you? 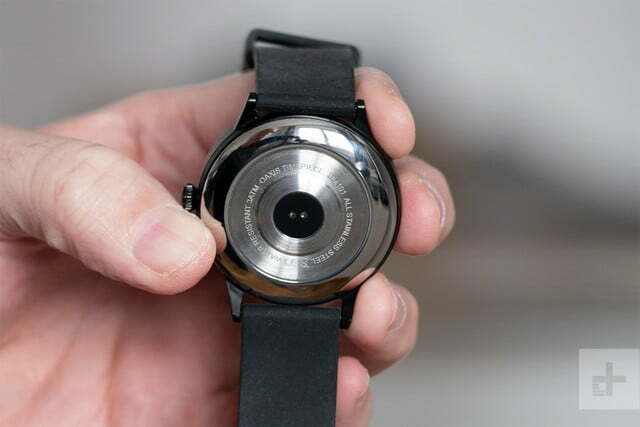 The Nokia Steel HR scrolls its messages across the screen, and doesn’t require multiple button presses and 100-percent attention to figure out what’s being communicated. Miss a screen, or misinterpret a long word spread across more than one screen, and the essence of the message gets lost. 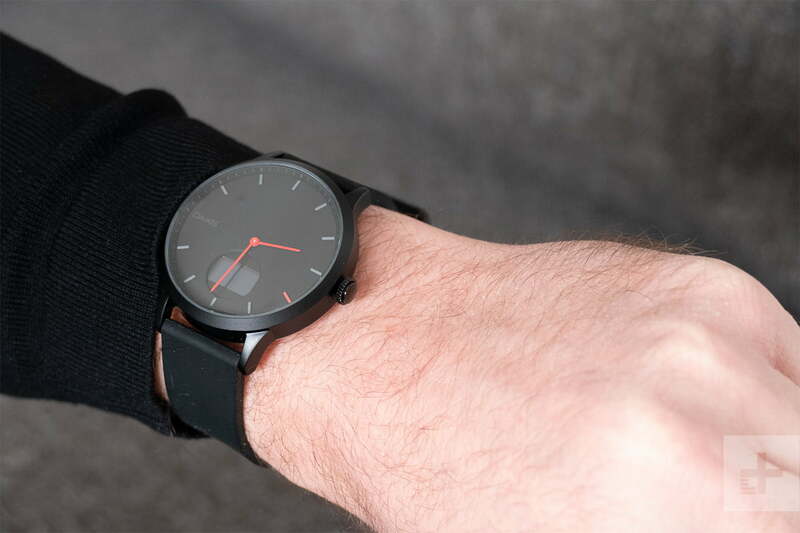 No excuses: Notifications must be glanceable on a wearable, and they’re not on the Oaxis Timepiece. It gets worse. There’s no clear-all option, and as notifications stack up, you have to press the crown to dismiss every screen individually before you get back to the standard step count and date screens. This is ridiculously time intensive, and practically ruins the only good thing about the display in the first place — seeing your step count. Thankfully, in the Oaxis Timepiece app you can turn off notifications entirely, or at least remove certain apps that may overload the screen with too many. But apart from this negating the point of buying a smartwatch with a screen, we shouldn’t have to do it due to poor design. We also would have liked slightly stronger vibration alerts, as they’re easily missed even on the strongest setting. Plus sides? The little icons denoting which app has sent a notification are cute and look good, and in daylight the watch face is easy to read. There’s no backlight though, and the OLED screen does not show the time, so it’s difficult to see at night. If the smartwatch features are less than successful, what about the fitness features? After all, the Oaxis Timepiece is supposed to be a replacement for wearing a fitness band, according to the firm’s Kickstarter campaign blurb. The display shows the number of steps you’ve taken, the distance you’ve walked, and the calories burned. The heart rate sensor on the back of the watch needs to be activated in the app. Why such a clinical description? It’s because that’s all you get. The Timepiece isn’t a Fitbit alternative as it does not have the ability to track individual workouts, or activate the heart rate sensor to operate continuously when out running. If all you’re interested in is knowing your step count, then it’s acceptable, but anything deeper than that isn’t available. To use the heart rate sensor you have to open the app, and choose the right function. It didn’t always work correctly, with zero readings happening at least once a day. I had a friend check to make sure I wasn’t actually dead (he confirmed I was alive), making this a problem with the Timepiece. When a reading came through, it was usually within a few beats off the Apple Watch Series 4, but always over its reading and never under. The app itself is required to set the time on the watch. The pairing process takes a few minutes, and we paired with both an Android phone and an iPhone. It took a few tries at first, as it’s not clear you must press the crown when a Bluetooth symbol and a question mark appears on the watch’s display. Once we figured this out, the process ran smoothly. All your fitness data is collated in the app, with graphs showing steps, calories, and distance, plus your heart rate. It’s basic but pleasingly designed. The Timepiece isn’t a Fitbit alternative. It tracks sleep too, if you wear the watch overnight. Sleep sensing can be set up using a timer — for example, it enters sleep mode at 11pm every night — or left to the watch to automatically recognize using its accelerometer when you’ve gone to bed. The silicone strap didn’t get too sweaty or annoying overnight, and the auto sleep recognition worked well. In the app, you get an overview of sleep states too. It’s a great feature missing from some competing hybrid smartwatches. Battery life is one of the Oaxis Timepiece’s strong points, lasting 30 days on a single charge according to the company. We have yet to complete 30 days use of the Timepiece, but it loses around 5-percent each day, meaning that while it may fall short of this target, it’s still decent. Charging is completed using a supplied plastic plinth with two pogo pin contacts that connect to any point on the watch’s case back. This means you don’t have to be very precise when putting it on the charger, but it’s not very secure and does wobble about quite a bit, making the watch is easy to displace. The Kickstarter campaign where the Timepiece emerged from has ended, and Oaxis has placed the fully-funded watch up for sale on its own website. The 38mm version costs $160 and the 41mm model is $180, regardless of whether you choose the black or white-faced version. Shipping begins in February 2019. All Oaxis products come with a one year international warranty covering quality and material defects. The warranty notes that any product purchased outside of its shop — on eBay for example — will not be covered. Don’t let the Oaxis Timepiece’s cool minimalist design win you over, as the notification support is poor, and the fitness tracking too basic to justify the price. The list is long and varied. The main problems with the Timepiece are the notifications and the screen. They’re not useful, and we turned them off. So with this in mind, you’re better off picking just about any hybrid smartwatch as you can have basic, but workable notifications, in a watch that looks like a watch. We like the Fossil Q Commuter, or the Q Neely, which start at $155. 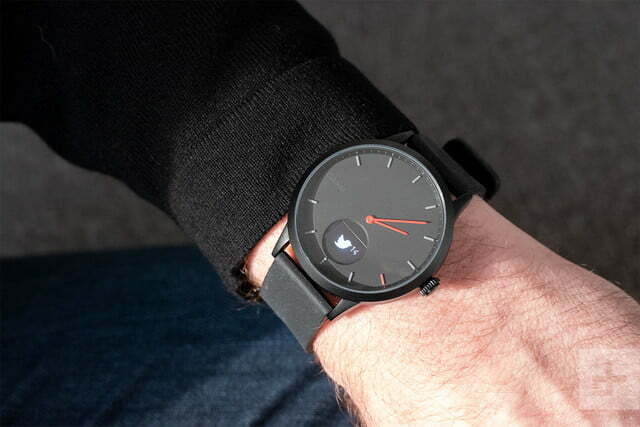 Also, take a look at Skagen’s hybrids for a minimalist style like the Oasis Timepiece. The Nokia Steel HR does everything the Oaxis Timepiece does and costs the same, but we think the notification delivery is better. If you want a touchscreen, but not a full Wear OS smartwatch, the Huawei Watch GT or Honor Magic Watch are potential alternatives. These look like smartwatches, rather than a regular watch, but have the added benefit of surprisingly long battery life and full fitness tracking features. Neither are available in the U.S. yet, but costs 180 British pounds, a little more than the Oaxis Timepiece but with a lot more functionality. If you want a full Wear OS smartwatch, the Mobvoi Ticwatch C2 has everything you could want for $200, while the Ticwatch E2 is $160. Either would be a better purchase than the Oaxis Timepiece if you desire more functionality. From here, prices rise, and you’ll find more about those options in our best smartwatch recommendations list. The Oaxis Timepiece is well made and feels long-lasting. The glass covering the face is apparently scratch resistant, and the body is water resistant to 30 meters. The straps are easily replaced too, if one should accidentally break. Because the battery only needs charging about 12 times each year, it should have a long life ahead of it. We’re also pleased to see Oaxis has used a Swiss movement for the Timepiece, selecting a Ronda quartz movement for accuracy and durability. You will probably stop wearing the Oaxis Timepiece long before it stops operating or breaks. No. The notification system is too frustrating to use on a daily basis, and we were forced to disable it in the app. This has the effect of making the Timepiece an expensive fitness tracker without extensive workout tracking features. Other problems on top mean there are superior alternatives available for the same price, or even less.